Standard Models - Domel, Inc. 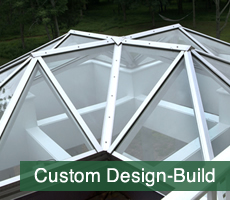 Insulated glass skylights as manufactured by Dome’l Inc. Clifton NJ. The skylights will be factory assembled units, each consisting of a thermally broken frame (to prevent condensation on interior frame wall) will be fabricated from (.078″ ) 6063 T-5 extruded aluminum with mitered, welded corners. Standard glazing will be insulated glass comprised of a tempered outboard lite with Low E and a laminated inboard lite. Flange sections will have a built-in rain diversion channels and pre-drilled holes. Mounting screws included. Venting model will have an operator fastened to the aluminum frame with a crank handle. Venting model with a hinging mechanism which incorporates two continuous aluminum extrusions: a ball-shaped extrusion on the top sash will be inserted into a extruded channel on the base frame. Aluminum framed screen with fiberglass mesh included. 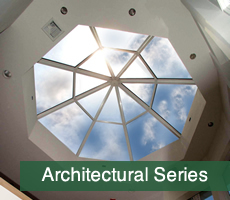 Insulated glass skylights as manufactured by Dome’l Inc. Clifton NJ. 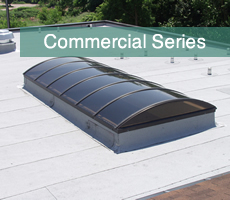 The skylights will be factory assembled units, each consisting of a thermally broken frame ( to prevent condensation on interior frame wall) will be fabricated from (.078″ ) 6063 T-5 extruded aluminum with mitered, welded corners. 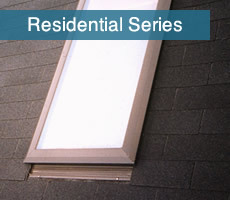 Standard glazing will be insulated glass comprised of a tempered outboard lite with Low E and a laminated inboard lite. Frame will be at 90° angle with pre-drilled holes to set on 1.5″ wood curb ( by others ). Venting model will have an operator fastened to the aluminum frame with a crank handle. The hinging mechanism will incorporate two continuous aluminum extrusions; a ball shaped extrusion on the top sash will be inserted into an extruded channel on the base frame. Aluminum-framed screen with fiberglass mesh included. Frame system is designed to set on a 1 .5″ wood curb ( by others ).